Six beats are offered on this truly delightful chalk stream. They all contain a fine head of wild trout with a few stocked fish, although please note that the Tolpuddle beat is not stocked. Our Piddle beats are lightly keepered and offer highly challenging fishing in beautiful surroundings. As with all our beats there is a strict “catch and release” policy to maintain the wild stock (maximum 10 fish/day). This involves the use of barbless hooks and the release of fish with the minimum of stress. If you have not tried “catch and release” before please talk it over with us at the time of booking. 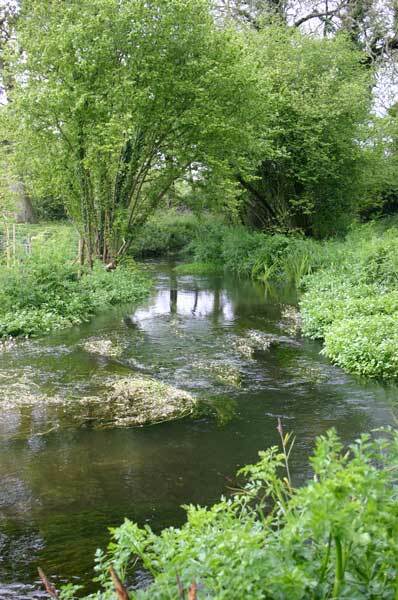 The Game Conservancy chose the Piddle at Tolpuddle as the site for a six year population study on wild brown trout and research into habitat improvement measures; a great compliment to us and a wonderful endorsement of our management policy over the last thirty plus years! Over the years Wessex Water PLC, the Game Conservancy Trust and the Environment Agency have implemented various highly beneficial schemes to reduce abstraction and enhance the river habitat. The fly life here is excellent, with the cream of the fishing starting with early Olives and Hawthorns followed by the Mayfly. Sport often picks up again in the Autumn, with late hatches of Olives and Sedges. The beats at Throop, Culeaze and Warren Lane have the added bonus of a good hatch of Grannom in April. Pray for a warm sunny day! Beats 1 and 2: (approximately 1/3 and 2/3 mile). Here the river is picturesque and very peaceful, meandering through water meadows with a perfect procession of pools and gravely runs providing delightful dry fly and nymph fishing. Beat Prices: Please find the prices for all our beats listed here. Non residential day tickets are printed in RED and residential (in our B&B) day tickets in BLUE. Please make ticket reservations as early as possible in the year to ensure a good chance of booking the exact days required. It helps if a good spread of dates and beats is chosen. Please write, email, use the form in the right column or telephone with your list of requested beats and dates.